The gorgeous beauty Rashmika Mandanna is once again teasing the Telugu movie lovers with the teaser of Vijay Devarakonda’e Dear Comrade. Repeating the stunt of Geeta Govindam, she once again locked her lips with Vijay in this youthful entertainer and shocked her fans. For the first time, she responded on this most talked liplock. Rashmika has been in news after breaking up her engagement with her ex-lover and hero Rakshit in Kannada field. Since then, many gossips hit her on tabloids and some of the netizens found fault with her. Within no time, her liplock in Telugu flick Geetha Govindam too trended and this beauty was called bold within no time. Now the same kiss is repeated in Dear Comrade and the flick is releasing in Kannada as well. To cut the tension, she herself responded on this kiss. Rashmika opined that there is nothing bad in attempting such scenes and she agreed for that as the scene demanded and makers convinced the importance in the situation. This Chalo actress is asking to watch the flick after the release to see the backdrop of that liplock and then they would change their minds. 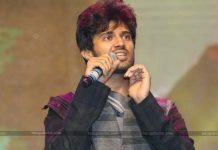 Dear Comrade starring youth Icon Vijay Devarakonda is hitting the silver screens on 31st May of this Summer end. This flick is getting released in all of the four South Indian languages at a time for the first time in Vijay’s career.